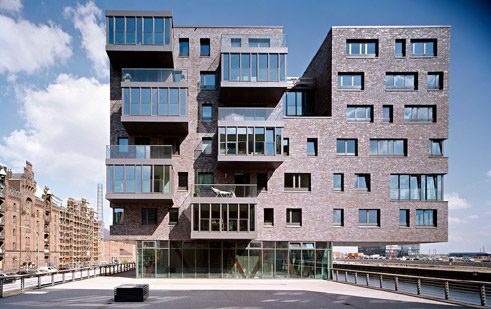 Not just since the 1920’s has brick as a construction material defined the face of the Free Hanseatic City of Hamburg. 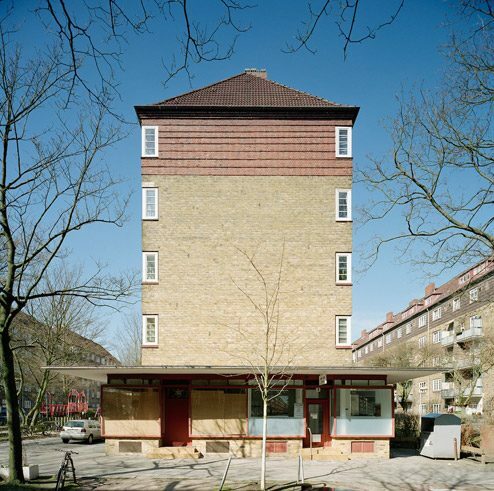 During this period incomparably more of these red brick buildings shot out of the ground as elegant, sometimes defiant and at the same time nautically streamlined Kontorhäuser (office buildings) and workers’ housing projects. The tradition of this construction material goes back to the Middle Ages and is also fired into the silhouettes of other Hanseatic cities of the North and Baltic Sea region like a connecting raw material under the northern skies. 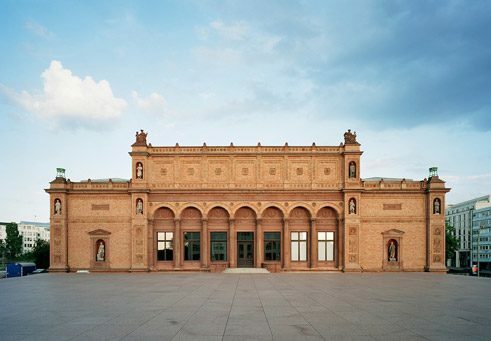 But particularly in Hamburg, this tradition has been cultivated and developed over the centuries to the present with great appreciation by craftsmen, architects and artists. Brick was viewed by builders and their architects as a more effective and durable material in the rough climate of the north than softer cut-stone or ashlar masonry or stucco facades. Clay is the basic and main ingredient of each brick. What decides the brick’s character, its surface structure and its incomparable play of red, yellow, blue-violet and black is not so much the clay mixture, but the firing process. The fire, heat and length of the firing process determine the brick’s qualities. Once bricks are cut into shape, they are stacked and slid into the kiln after they have dried. Heat hardens the bricks, above all water-proofs them and protects them from the effects of frost. The hotter the firing temperatures, the darker the brick, and the greater the change in colour. 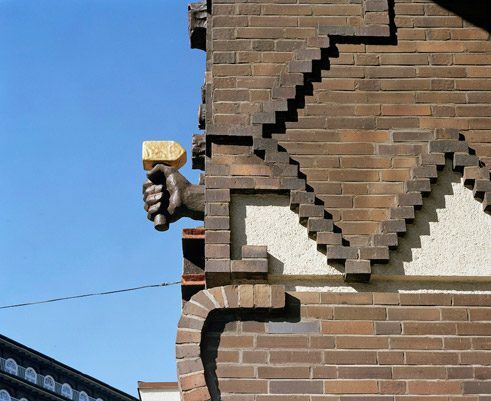 In Hamburg, this hard-burnt brick, the so called clinker, is an identity-defining construction material that to this day is used for all building purposes, public, private and commercial, and starting in the 20th century, was systematically utilised in entire areas of the city. Hamburg is famed for its harbour. 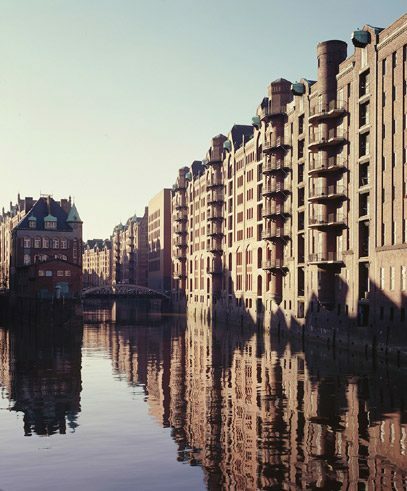 The Speicherstadt on the grounds of the Hamburg Freeport, built in 1888 and dissolved only in 2013, was listed in July 2015 together with the Kontorhaus office district as part of the World Cultural Heritage by UNESCO. 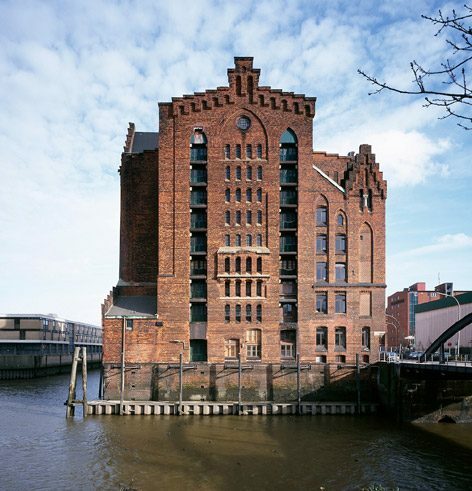 This warehouse complex, the largest of its kind world-wide, arose between 1885 and 1927 on a group of islands in the Elbe in three construction stages under civil engineer Franz Andreas Meyer (1837-1901). The red brick warehouses with their neo-Romanesque and Gothic gables, arches, parapets, towers and bowfronts and connected via bridges, roads and canals, were the reloading points for coffee, tea, tobacco, rubber, rum, raw silk and oriental rugs. Deliveries were handled directly from the water with specially-designed loading vehicles. Longshoremen unloaded the ships with cable winches and muscle-power. During the years of the Economic Miracle, new warehouse facilities were added, such as Kaispeicher A, designed in 1963 by Werner Kallmorgen (1902-1979). 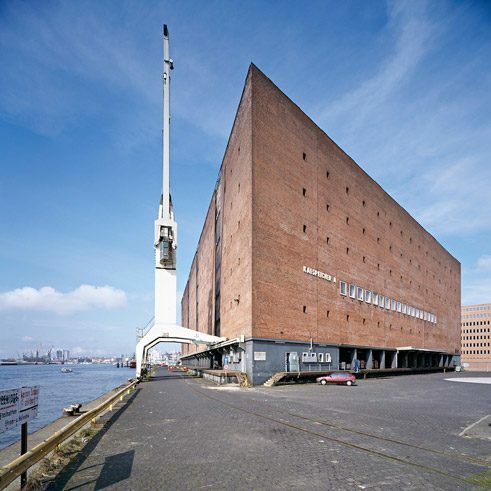 This red-brick building is the highest point of the Speicherstadt and was the only warehouse where seagoing ships could dock and be unloaded directly. This building also lost its function with the conversion of maritime trade to a container port. 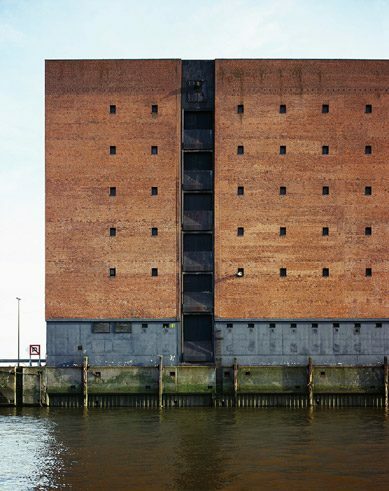 Today, the completely-gutted Kaispeicher serves as the basis for the Elb Philharmonic designed by the architectural firm Herzog & de Meuron, and as a landmark for Hamburg and its HafenCity. The Kontorhäuser that arose starting in the 1920’s are the most beautiful architectural signifiers of the intersections of harbour and life, business and culture that make up the heart of the mercantile and maritime trade city of Hamburg. At that time, Kontorhäuser were an enormous innovation: they separated residence and work, and were conceived solely as the offices of commercial enterprises. 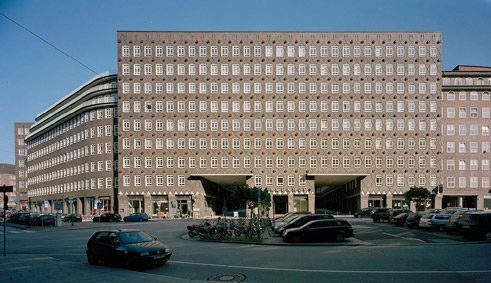 With their iron-grey stone surfaces shimmering under the slanting rays of the sun, the ornate facades of the Chilehaus and the Sprinkenhof, both office buildings by architect Fritz Höger (1877-1949), convey more than just physical presence. 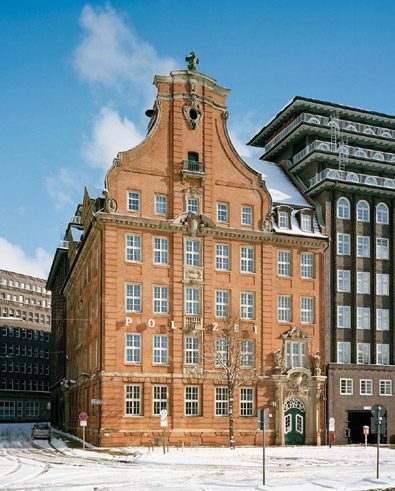 Hamburg’s architects have often enlivened the homogeneous appearance of clinker buildings with a variety of means. Occasionally an interplay of matte hand-moulded bricks and shiny clinkers suffices for the purpose. Even the formation of joints and the colour of the jointing mortar influence a clinker building’s character. 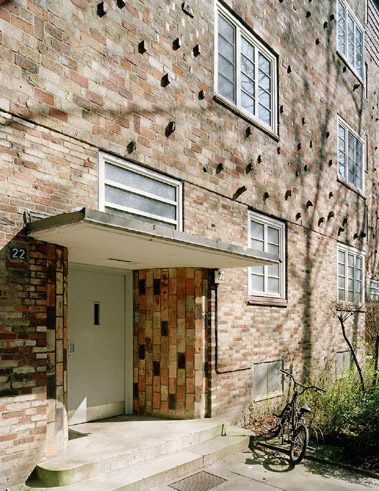 Architect Gustav Oelsner (1879 – 1956), who served as construction senator in the 1920’s, gave brick architecture a new dimension. 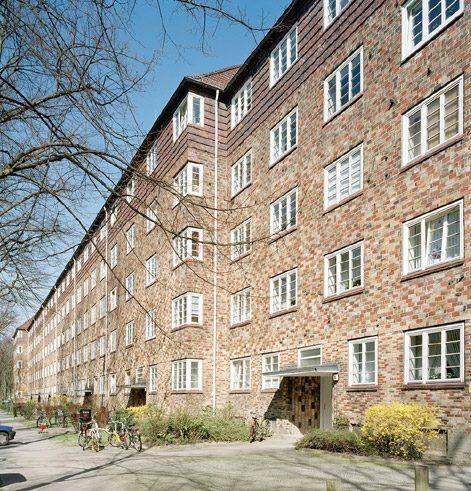 His design for the residential quarter on the Bunsenstraße arose in 1927 right after his first encounter with social housing in Amsterdam and Rotterdam. With a variety of formats, the exterior walls of the Zeilenbau linear block homes are modelled into a rough, lively and tactile surface in different shades using almost-white, red, deep-blue and violet clinkers. Architect Fritz Schumacher (1869-1947), who served as Hamburg’s chief construction director until 1933, wished to give the city a sense of community through construction with red clinkers. 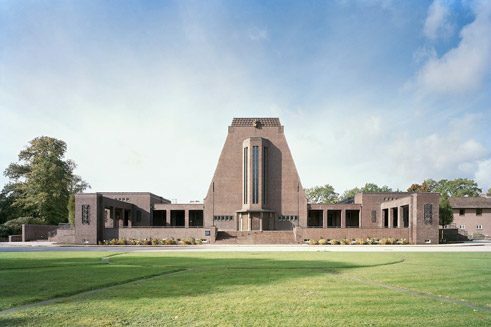 For him, brick architecture was “the language of everyday life.” The crematorium at the Ohlsdorf Cemetery conveys Schumacher’s vision of this mode of spatial ordering as a guidepost beyond death as well. With its monolithic clinker structure, this building’s sublime presence towers over all worldly concerns.